Special Offer. Buy 6 Bottles for £47.50 each. Save £30.00 !! Single Bottle Price - £52.50. Deep yellow with golden highlights and fine, delicate bubbles. 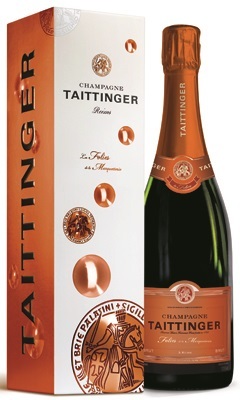 It has an intense, fruity bouquet with aromas of peaches, apricot jam and subtle hints of toasted brioche and vanilla. "Les Folies de la Marquetterie" is a blend of 55% Chardonnay and 45% Pinot Noir. Slow ageing for 3 years in bottles brings the flavours of this champagne to perfect harmony. The Château de la Marquetterie is situated in the heart of the Champagne winegrowing region and owned by Champagne Taittinger. Prior to the French Revolution it was a meeting place for philosophers and authors of the "Age of Enlightenment" and a site for village fairs. The vineyard around the Château de la Marquetterie is known as "Les Folies" and is a sunny south, southwest exposed vineyard, this combined with its soils produce Chardonnay and Pinot Noir grapes of exceptional quality. This cuvée is produced exclusively from grapes grown at "Les Folies", picked after the first "green" harvest, giving the wine optimum sweetness and aromatic maturity. Only wines from the first pressing are used, each plot being vinified in small volumes and certain lots in oak casks.